Brighton’s first Bikehangar – an on-street lock up for bicycles – has been officially handed over to residents. The University of Brighton-led project is funded by the Engineering and Physical Sciences Research Council (EPSRC) and Brighton and Hove City Council’s Local Sustainable Transport Fund (LSTF)*. The hangar was formally presented on Tuesday, 9th September to the Ditchling Rise Area Residents Association (DRARA) which will manage the facility. The hangar, on the corner of Ditchling Rise and Shaftesbury Road, is part of the university’s ‘smart e-bikes’ research project which is trialling and researching electrically-assisted cycles. The ‘smart e-bikes’ research project, led by the University of Brighton between 2011 and 2014, is funded by the EPSRC. The aim of the project is to understand how people engage with smart e-cycling and the issues for policy, design/product development and research that could lead to a higher uptake of e-bikes in the UK, with the aim of reducing carbon emissions. The new hangar has six spaces available for rent by nearby residents. Attending the handover were: Abby Hone, Principal Transport Planner, Brighton & Hove City Council; Chris Sevink, Chair of the Ditchling Rise Area Residents Association; and Frauke Behrendt, Project Leader, Smart e-bikes Research Project, University of Brighton. * Further information on Brighton & Hove City Council’s LSTF project can be found here. The Smart e-bikes project loaned Brighton and Hove City Council (BHCC) three electric bikes for three events in February and March 2014 as part of the Personalised Travel Planning (PTP) scheme. PTP aims to help residents think about the way they travel around Brighton and Hove and supports them in making more sustainable travel choices. The aim of the e-bike trial sessions was to give residents the opportunity to ‘have-a-go’ on an e-bike and get feed-back on their experience which it was hoped would add value to the Smart e-bike project. Energy Café, Hollingdean Community Centre, 15th February, 2014. 18 residents signed up (9 at Hollingdean, 6 at Circus Street and 3 at Hanover) and had a go with each ‘lesson’ varying in length depending on the ability/confidence of the cyclist. 7 residents asked to be kept in touch with the smart e-bikes trial. All said they had enjoyed the experience. Steve Kelly, a Transport Planner for BHCC who organised the events, wrote the following short report on the e-bike sessions. “I cycled the e-bikes a few time a week, for 5 weeks, mainly between Hollingdean and Hove and attended the three events. During this time I cycled on the flat and on many hills, in sunshine and pouring rain. I also looked after the e-bikes between the events, doing simple safety checks and making sure the batteries were charged. I really enjoyed riding the e-bikes and found them especially good when in electric mode against the wind on the sea-front. They were also great when having to ‘get away’ at busy junctions which were up-hill; cycling up any hill could also be made much easier. They were also great fun. On the down-side, I’d agree with the comments about feeling big and heavy, but I guess as technology develops they will become lighter. I also felt uncomfortable about leaving them locked up anywhere other than in the agreed locked storage (so didn’t), but if I owned one myself this would be less of an issue. My ‘stand – out moment’ from the three trials was watching the resident who wasn’t able to cycle any more (due to health reasons) but was able to have a go on the e-bike. The last of the bikes are being returned this week after two very successful trials with staff from the University of Brighton. The first trial participants collected their bikes at the end of June / early July and over the following two months the participants were able to take advantage of the wonderful summer weather. In September the bikes were returned, serviced and sent out again with the second tranche of participants. Forty members of staff took part in the two trials; the participants were based in all three of the university’s Brighton campuses which are spread across the city. The project team would like to take this opportunity to thank everyone involved. An enormous amount of data and information has been collected during these trials; we will now be busy collating and analysing this rich source of material and preparing the project report! The Smart e-bikes project is pleased to announce that the Smart e-bikes project at the University of Brighton has funded Brighton’s first Bikehanger, an on-street lock up, in a residential neighbourhood in Brighton. The Bikehanger incorporates 6 spaces and initially 3 of these will be used by the project for a community trial. Two sets of local residents will participate in the trials; the first 3 people have taken their bikes and will be using the bikes over the next couple of months. On 7th September, the local residents association, Drara, posted the news about the Bikehanger plus new parking spaces for twelve more bikes. These spaces had been installed following discussions between Drara and relevant authorities and were funded as part of an ongoing initiative to integrate local transport. Once the trial use is over, the Bikehangar will be handed over to the management of Drara with spaces available to rent for nearby residents. 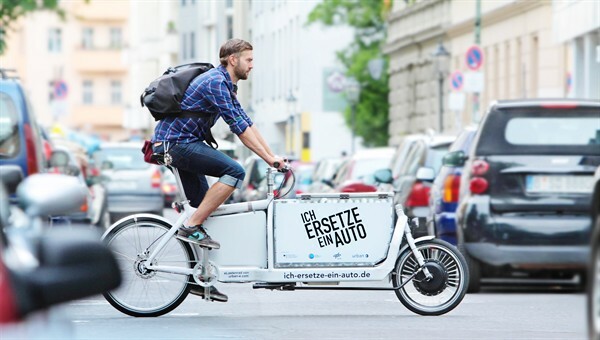 As our German researcher Frauke can testify, e-bikes are very popular in Germany. This article from the Guardian on Saturday describes new e-bike businesses setting up in the UK to take advantage of the European craze heading this way. Solsonica and POLI.design are offering €7,000 in prize money for innovative projects involving an electrically assisted bicycle and a photovoltaic shelter to protect and recharge it. The Leader is published by The Argus.